I have another round of empties slated for the recycling bin. I'm spending my Sunday tidying up (my blog, my makeup, my closet, my room, basically everything), and thought I'd do this quick post so I can finally get rid of these. I'm a terrible empties poster. When I do finish a product, I often forget to hang on to it. Don't get me wrong, though, most of those items are little samples. Full size products are much harder for me to finish. I find it difficult to stick to one product for long durations. Commitment issues. There are just so many new and intriguing products out there. But hey, here are a few things I've managed to use up & commit to film. Let's start with some skincare stuff. 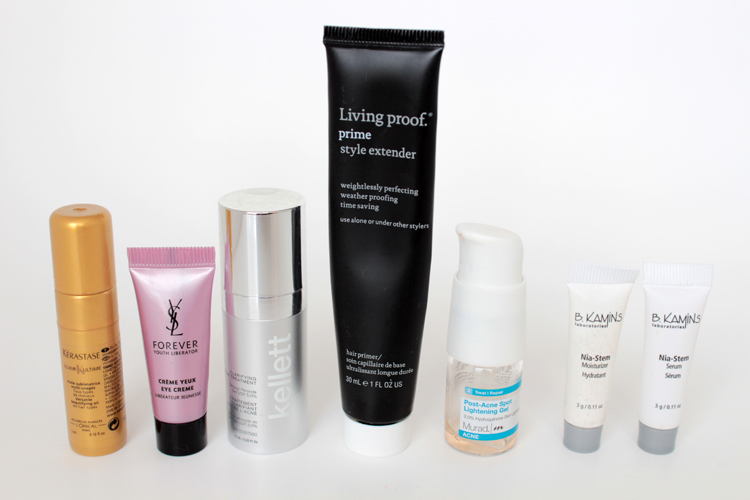 Though I do try a lot of skincare products, I'm always reluctant to review them because it's such a personal thing. We could have the exact same skin type, but I could still love a product that you hate. It's all about preference. It goes without saying how much I adore this scrub. Despite being gentle on my skin, it really cleans & leaves my skin feeling smooth. Repurchase? Always! I rate this product mediocre. It is supposed to rejuvenate the skin overnight with a gentle peeling action. I don't feel like it left my skin looking any different the next morning. No radiance, no evenness in appearance. I think my skin did feel slightly smoother though -- could have just wishful thinking. Repurchase? I don't think so. I've started interjecting retinol in my nightly skincare routine and I've been loving this one from Neutrogena. It's a subtle product, the ingredients are not overly concentrated or strong. I've been using it for about 6 months now and I have noticed an overall improvement in my skin. Repurchase? Yes! I just picked up a new one a few weeks ago. I've heard lots of good things about this eye cream, but I wasn't that impressed. The cream does last a long time. It took me over 6 months to use it up and at one point I was using it for day & night. It has some light reflecting particles in the cream, but nothing too noticeable over my dark circles. I didn't find it as hydrating under the eyes as I hoped. Repurchase? Not for me. My skin is prone to hyper pigmentation and dark spots, so when I spotted this (pun intended), I was intrigued. It sort of works. I found that it did lighten (albeit not overnight) new / recent dark spots, but it did nothing for old dark spots. Repurchase? I think I would. I am slowly making my way through the abundance of makeup / skincare samples I have accumulated this past year. This is a lovely hair oil. It felt great in my hair. Smoothing, non-greasy, smells pretty good. Not overly wow-ed though. There's a L'Oreal product out there, I think it's called Nutri-Sleek, that offers similar results without the inflated price tag (makes sense since L'Oreal is the parent company). Purchase? Probably not. I quite liked this eye cream. Though I didn't notice a dramatic difference in the appearance of my under eyes, it is really moisturizing. The price for the full size is a lot. Purchase? I would if I didn't think that eye creams are glorified moisturizers. Don't really have too much to say about this. This cream contains 5% Benzoyl Peroxide, and I don't really find that it works any better (or worse) than other products with the same active ingredients (specifically the Clean & Clear acne line). I do like that the company is Canadian, though. Purchase? Probably not. This stuff I love. It works so well with my hair (though my hair isn't overly hard to work with). It keeps my hair smooth throughout the day & it keeps the style intact until the day after. It works well on air dried hair, but even better on a blowout. Purchase? Yes. I had similar results with this as I did with the Garnier Dark Spot Corrector. It does work on new-ish spots, but not on older ones. It contains 2% Hydroquinone, which is a skin lightening ingredient, but you can find that ingredient in many products nowadays. Purchase? No. Nothing much to say about these two. I found them to be moisturizing, but there wasn't enough product to see a noticeable difference. I find my skin takes at least two weeks to show results (if any) from a skincare product. These tubes only contained enough product for a couple uses. Purchase? No. I have so many hand creams that I need to start using up. I can manage to use them up fairly quickly, though. I apply hand cream repeatedly throughout the day, especially during the Winter season. This was a freebie from a Glymm order I placed a few months ago. I wasn't that impressed with it when I first used it, but it grew on me. It was moisturizing and it really did make my hands look / feel silky (especially my cuticles). Purchase? Yes. This smells heavenly. That has always been one of the draws of Cake products. It's also moisturizing on the hands. It soaks into the skin fairly quick & is non-greasy. Repurchase? Yes. I love finishing things. You did a good job! You have talked so much about that Clinique scrub .. you have me wanting to pick it up! Must get through all my current samples first tho! You also have me wondering about the garnier dark spot corrector I sure do need something like it ! ... but for pre-existing dark spots .. any suggestions? Great empties! 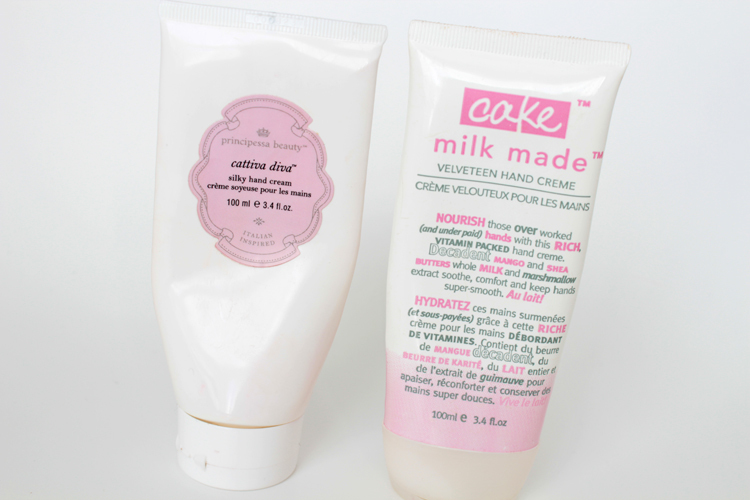 I really like both of those hand creams. I've never used retinol creams because I burn so easily and I'm terrified of making my skin more sun-sensitive than it already is. Do you notice a difference in sensitivity when you use it? 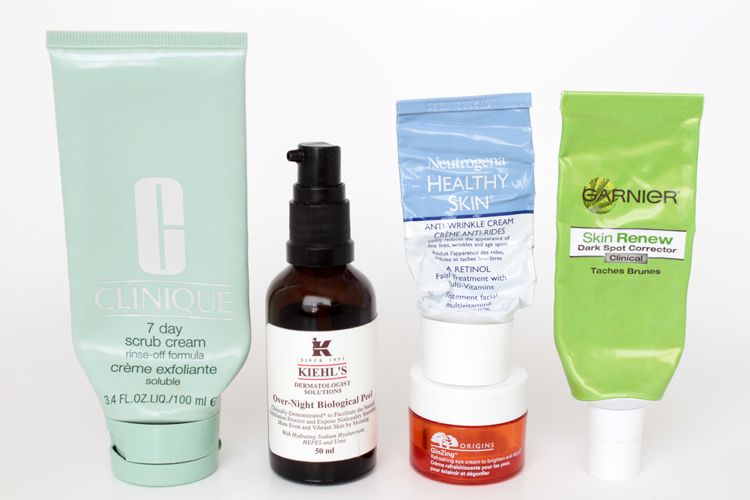 I'm pretty bad at empties posts as well - I've never even done one :p I am curious to try Kiehl's and Origins skin care, but I'm wondering if I'm going to be similarly underwhelmed! Love the 7 day scrub! I just picked up the Style Extender thanks to you! Great job on your empties! !